Over 1 billion people are infected with one of the 14 diseases defined by the World Health Organization (WHO) as neglected tropical diseases (NTDs). These are the most common infections in the 2.7 billion people living on less than $2 a day and affects those often marginalized and forgotten by governments, left to suffer in silence. NTDs are diverse but all cause severe disability or death, and bring a major economic burden on endemic countries. In 2006, USAID began a $100 million five-year NTD control program concentrated on 5 of the 14 WHO identified NTDs, which has since been expanded to reach an annual budget of $65 million in 2010, as well as extending the program aim to 30 countries. Through RTI International and its partners, the program has supported the delivery of over 221 million treatments to more than 55 million people, and trained over 200,000 drug distributors, trainers and supervisors in 12 countries in just the first 3 years of implementation. The President?s 2011 request of $155 million demonstrates both the U.S. commitment to NTD control and the ability to show the impact of the previous efforts. The recently announced GHI aims to ?reduce the prevalence of 7 NTDs1 by 50 percent among 70 percent of the affected population? contributing to the eventual elimination of onchocerciasis, lymphatic filariasis and leprosy. It is essential though that any NTD initiative is comprehensive and expands to include and take an integrated approach to all the 14 listed diseases. Some of the diseases currently excluded include fatal or devastating diseases like visceral leishmaniasis, sleeping sickness, Chagas disease and Buruli ulcer. They are often under resourced or left out of control and treatment programs because they are considered more difficult and costly; the available tools are limited; there has been negligible research; and there are less measurable results due to poor diagnostics and data collection systems. These barriers beg for greater and more directed attention to an effective response to these diseases, not less. For all 14 diseases, R&D should be a high priority to ensure sustainable control and elimination. 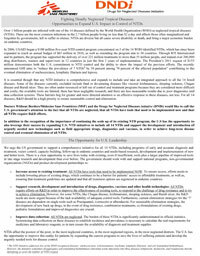 Doctors Without Borders/Médecins Sans Frontières (MSF) and the Drugs for Neglected Diseases initiative (DNDi) would like to call the U.S. government?s attention to the fact that all NTDs are neglected, that all NTDs have tools that need to be implemented now and that all NTDs require R&D efforts. In addition to the recognition of the importance of continuing the scale up of its existing NTD program, the U.S has the opportunity to also leverage their success by expanding U.S. NTD initiatives to include all 14 NTDs and support the development and introduction of urgently needed new technologies such as field appropriate drugs, diagnostics and vaccines, in order to achieve long-term disease control and eventual elimination of all NTDs. Increase access to existing treatment: All NTDs have tools that need to be implemented NOW. To ensure access, efforts needs to include lowering prices of existing drugs, which continues to be a barrier for patients? access to affordable treatments, as well as, ensuring that treatment guidelines are updated and that all treatment options are registered in endemic countries. Support research, development and introduction of drugs, diagnostics, vaccines and other health technologies: All NTDs require efforts on R&D in order to improve the effectiveness of existing tools, to respond to the challenge of drug resistance and to try to achieve elimination. However, for some NTDs, like Chagas disease, leishmaniasis, sleeping sickness, and Buruli ulcer, the R&D needs are more urgent because of the lack availability of adequate control tools. Furthermore, current elimination strategies for the ?7? diseases are dependent on single tools such as Praziquantel, ivermectin or albendazole. For sustainable elimination strategies, the development of new back up drugs, in the event of drug resistance, combination treatments, co-formulations of existing drugs, pediatric formulations and improved diagnostics are crucial. Improve data collection: All NTDs are neglected. The burden of these NTDs is significantly underestimated in official statistics. Systemizing data collection on these diseases to establish incidence and prevalence is necessary to calculate the real requirements for medicines and laboratory reagents, to in turn ensure the availability of diagnosis and treatment supplies. NTDs affect the poorest of the poor, in the most neglected countries, in the most neglected regions, in the most neglected districts. The U.S. has the opportunity to improve this reality for patients by expanding the current programs to save the lives of suffering patients and develop the urgently needed tools for disease control. Doctors Without Borders/Médecins Sans Frontières (MSF) is an international, independent, medical, humanitarian organization that delivers emergency aid in more than 60 countries to victims of armed conflict, epidemics, and natural and man-made disasters. MSF primarily focuses on the treatment of 4 of these 14 diseases, considered to be the ?most neglected?, with over 400 million people at risk: kala zar (visceral leishmaniasis or VL), sleeping sickness (human African trypanosomiasis or HAT), Chagas disease (American trypanosomiasis), and Buruli ulcer. All of these, except for Buruli ulcer, are fatal if left untreated and have the highest death rates of all the NTDs. Despite the challenges associated with responding to these diseases, MSF has been able to diagnose and provide life-saving treatment for the victims of these NTDs over the past 10-20 years, and continue to prioritize these populations. In 2008 alone, MSF treated over 8,500 patients suffering with these NTDs and screened thousands of individuals. The Drugs for Neglected Diseases Initiative (DNDi) is a not-for-profit product development partnership working to research and develop new and improved treatments for neglected diseases, in particular, human African trypanosomiasis, leishmaniasis, Chagas disease and malaria. With the objective to address unmet patient needs for these diseases, DNDi was established in 2003 by the Oswaldo Cruz Foundation from Brazil, the Indian Council for Medical Research, the Kenya Medical Research Institute, the Ministry of Health of Malaysia, the Pasteur Institute, and Médecins sans Frontières (MSF). WHO/TDR acts as a permanent observer. DNDi has delivered three products - two fixed-dose anti-malarials ?ASAQ? and ?ASMQ?, and a combination treatment for the advanced stage of sleeping sickness ?NECT? (nifurtimox-eflornithine combination therapy). Working in partnership with industry, academia, and disease endemic country partners, DNDi has built the largest ever research and development portfolio for three deadly neglected tropical diseases and is on track to deliver 6-8 new treatments by 2014. The NTD Initiative addresses five of the WHO recognized diseases: onchocerciasis, schistosomiasis, trachoma, lymphatic filariasis, and soil transmitted helminthiasis. However, the Initiative sometimes disaggregates soil-transmitted helminthiasis (intestinal worm infections) into three diseases (whipworm, hookworm, and roundworm) thereby identifying as seven the number of NTDs treated.